New Player and nothing to play on yet? Make Campaign publishing faster and more efficient. As your digital signage operation evolves, you might find yourself looking for a specific Campaign among hundreds, or scrolling down endlessly, looking for Campaigns to fill your newly set up player. Make this procedure quicker with tagging. 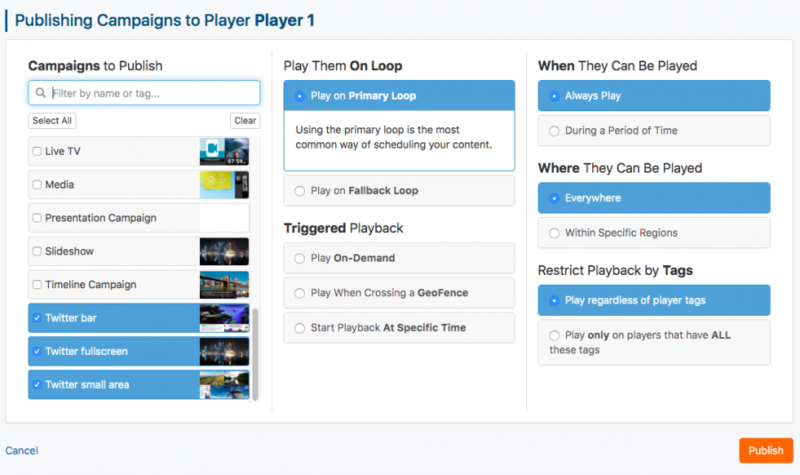 In your OnSign TV account, go to the Players tab on the left and select the device you want to publish new content to. Hit the “Publish to Player” button. 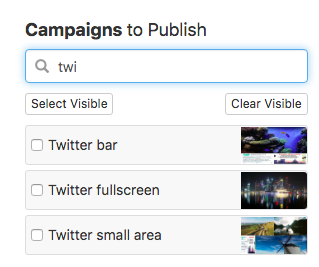 On the loaded page, type in a tag you have set to some of your Campaigns in the search field. For this tutorial, we have chosen publishing several Twitter Campaigns to a Player. Click on “Select All” underneath the blank. This will add our three Twitter Campaigns. In case you want to add any other Campaign to the device, clear the text field and search for another Campaign by tag or name. Set publishing filters and confirm with "Save"!